Shopping for an upgrade to your current mattress in the Washington DC area? Make sure to use our guide to find the best deals on the highest quality mattresses. The city of Washington DC has a growing population and growing economy, and plenty of mattress stores have popped up over time to meet the needs of this bustling populace. Reflecting the city’s spread of wealth, there are high-end options for luxury shoppers, and affordable mattresses for the budget-conscious. Of all the places to buy a mattress in Washington DC, the one with the biggest presence is Mattress Firm. This popular national chain dominates the market in Washington DC, with no less than 7 of the city’s 16 mattress stores. Other options include mom-and-pop mattress shops, locally owned warehouses and outlets, European luxury mattress stores, and a number of furniture stores that sell mattresses. Of all these options, where’s the best place to buy a mattress in Washington DC? We’ve combed the listings and reviews to help you narrow it down, with the highlights broken down by geographic area. Read on and find out the best place to buy a mattress in your neighborhood of DC. There are quite a number of mattress stores in central Washington DC. The most popular of these are locations of Mattress Firm, which has a total of three stores in the area. There’s Mattress Firm Dupont Circle (1643 Connecticut Ave NW), Mattress Firm Cardozo (1301 U St NW), and Mattress Firm Georgetown (1634 Wisconsin Ave NW). All are very highly-rated by users, but the Dupont Circle location is the most popular by far. With 139 Google reviews and an average of 4.9 stars, as well as 54 reviews and a 4.5 star average on Yelp, this is the highest-rated place to buy a mattress in Washington DC overall. Reviewers consistently praise the shop’s patient and knowledgeable staff, who show customers their options without upselling or pressuring them. Another well-reviewed place to buy a mattress in Washington DC downtown is Room and Board (1840 14th St). Room and Board sells high-end, American-made, sustainably sourced, well-crafted and stylish furniture, as well as mattresses. As with the stores furniture, all mattresses are high-end, American-made models, including encased coil, memory foam, natural latex, and innerspring models, with 11 comfort options (from ultra-soft to super-firm). Room and Board contracts with a Minnesota-based manufacturer to custom-build low-profile, luxury mattresses to suit the store’s beds. All assembling and edge finishing is done by hand, and traditional chemical fire retardants have been replaced with natural alternatives. The eco-conscious and chemical-sensitive will appreciate knowing that all foams are certified low-VOC by CertiPUR and are free of flame-retardant chemicals, lead, mercury, formaldehyde, and CFCs by . Another high-end, designer furniture store in the area which sells luxury mattresses is Urban Essentials (1401 14th St NW). This two-story contemporary furnishings boutique sells sleek and modern furniture and lighting, and is an excellent place to pick up a luxurious and stylish bed, along with a new Tempur-Pedic mattress. Shoppers in North DC will find a variety of high-end mattresses at Tier 4 Mattress (5720 Georgia Ave NW). This mattress shop specializes in deep discounts on luxury mattresses, and offers a variety of innerspring, memory foam, latex, foam and gel mattresses. The store’s setup is warehouse-style, with stacks of mattresses instead of a fancy showroom experience, but bargain hunters will be more than satisfied, as Tier 4 sells top-quality, high-end mattresses at a serious discount. Brands include Sterns and Foster, Spring Air and Tempur-Pedic. Those simply looking for the most affordable mattress should visit Casa Furniture (3457 14th St NW). This small, mom-and-pop discount furniture store also sells mattresses, beds frames, sleeper sofas, and rollaway beds. Another reliable option for a variety of brand-name mattresses is Mattress Firm, which has a location in Columbia Heights (3100 14th St NW). As with other branches, reviewers give top points to this store fro customer service, citing the patience, expertise and professionalism of the staff. Mattress Firm is known for holding regular special promotions, so customers would do well to look out for, and take advantage of, current special offers and seasonal sales. There are decidedly few places to buy a mattress in Washington DC in the southern part of the city. The lone mattress store is Mattress Firm Capitol Hill (625 Pennsylvania Ave). This store has earned excellent reviews for well-informed staff who guide customers through a “painless” selection process. Mattress Firm is the nation’s leading mattress chain, with over 3,000 stores nationwide and a 30-year track record. The store carries 55 different mattresses from name-brands such as Beautyrest, Serta, Simmons, and The Dream Bed. Mattress Firm focuses on solving sleep problems, such as backaches, snoring, and insomnia, through specialized products, such as adjustable beds, cooling gel, and sleep tracking technology, and can even accommodate partners with different temperature and firmness preferences. There are mattresses priced for a wide range of budgets available. The store will refund the difference if a customer finds a lower-priced product within 120 days of purchase and also allows exchanges and returns within this window. It’s not uncommon to find a mattress store in Washington DC that also sells furniture, or even home appliances. But how many mattress stores also sell clothing, DVDs, and groceries? The Walmart Supercenter (99 H St NW) sells all these- and pretty much anything else you can think of- along with a number of highly affordable mattresses. Shoppers here can pick up a memory foam bed-in-a-box, pillow top or air bed at a steep discount, though the inventory rotates frequently. 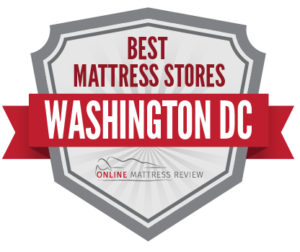 As with other parts of the city, Mattress Firm also has a presence in East Washington DC, with a well-reviewed location in Brentwood (1060 Brentwood Rd NE). In the far-east corner of DC, shoppers can also find an affordable mattress at Mattress Outlet Inc (4049 Minnesota Ave NE). DUXIANA (3307 Cady’s Alley NW), sells high-end, contemporary European bedroom furniture and DUX, the final word in Swedish luxury mattresses. This 90-year-old Swedish company produces mattresses made from top of the line materials, with the finest Swedish craftsmanship, ergonomic research and engineering. Their products are found in 150 of the world’s most exclusive hotels, and are made from top-of-the-line, sustainable, high-performance materials, such as slow-growth European pine, natural hevea latex, and high-thread-count cotton. Each mattress’ uniquely engineered “Pascal” spring system requires over one mile of specially milled, high tensile steel wire to construct, and customers can even have their mattress custom-fitted with separate levels and types of support for each side, or for head, body and legs. DUX’s own studies demonstrate that those sleeping on their mattresses experience an additional full hour of REM sleep compared to typical mattresses. On the more affordable end of the spectrum, Mattress Warehouse of Washington DC has outlets in two locations in West Washington DC: Tenleytown (4437 Wisconsin Ave NW) and Friendship Heights (5252 Wisconsin Ave NW). Mattress Warehouse specializes in affordable mattresses and personalized matching. The store’s proprietary “bedMATCH” diagnostic sleep system uses user-provided data (including 18 statistical measurements and over 1,000 scientific calculations) to quantify and measure support and comfort to identify the ideal mattress fit for each customer’s unique physiology and comfort preferences. Mattress Warehouse stocks popular name-brands like Serta, Sealy, Stearns & Foster, TEMPUR-Pedic, Kingsdown, and Aireloom, and has competitive pricing. The store promises to beat the prices of local competitors, offering a full refund plus 50% of the cost difference for a full year after purchase. Jus a block away, locally owned and operated, Newcomb Furniture (5225 Wisconsin Ave NW) is a great place to pickup a bed- or bedroom set- along with your new mattress. This long-running business sells appliances, flooring, and a wide range of furniture, along with Beautyrest and BeautySleep mattresses.